A Great Design Feature: Sliding Doors for Kitchen Pantry. Trending Home Décor is a Canadian owned and operated business that features design accessories for your home. Many of our customers consider us a leading online Canadian source for creative interior design. They come to us when they are looking for the creative decorative accents that make their house a home. We offer a wide range of exciting home décor pieces that you won’t find anywhere else. Art. Mirrors. Beautiful furniture in natural wood finishes. Floor and table lamps and other interesting lighting fixtures. Sliding pantry doors to efficiently close a kitchen pantry. Accent furniture and end tables. Bathroom, bedroom and dining room furnishings. We have it all. Check us out at www.trendinghome.com. You’ll be pleasantly surprised by the wide range of stunning home décor items available from Trending Home Décor. But let’s look at the options available to you if you’re looking for a sliding barn door. A pantry is a great place to use a sliding barn door in your kitchen. Why use sliding pantry barn doors? First of all take a look at any number of home renovation shows on TV. You’ll be surprised to find that pantry sliding doors are very popular because they’re an attractive design feature. They also take up less space than a traditionally hung three hinge door in a kitchen that is often short on space. Kitchens are often gathering places during family affairs or parties. A pantry with barn doors offers you easy access to your kitchen supplies without the need to disturb your guests by a door swinging wide to give you access to more chips or other food items. Rolling smoothly and quietly on our high quality sliding pantry door hardware you’ll be into your pantry and out again before you or your guests know it. Contemporary, upbeat and yet traditional and functional, barn door style pantry doors add beauty to your home and help to resolve space issues in smaller kitchen areas. A Wide Range of Sliding Barn Door Pantry Design Styles. Trending Home Décor is justly proud of its wide range of sliding pantry doors for a kitchen. Have a look at our website. Sliding barn door pantries are in style these days and we believe we offer one of the most interesting collections of sliding pantry doors available in the marketplace. You’ve likely spent considerable energy getting the feeling or tone in your home and in your kitchen ’just right’. We can help you continue that design style with our attractive and efficient sliding pantry doors that range from rustic to casual to formal in their appearance. You choose the style you want and we’ll offer you a door to match and enhance the overall tone in your kitchen. 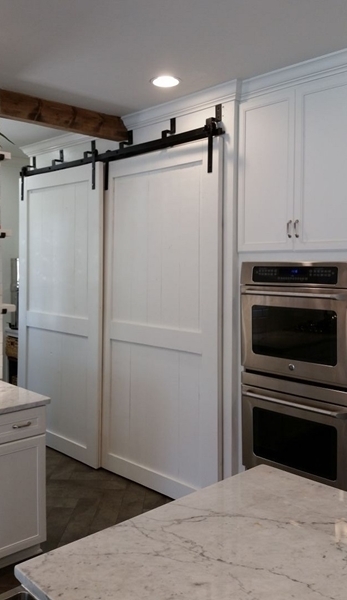 Let’s look at some of the options when it comes to sliding barn doors for a pantry. You want rustic? Consider our half-X rough sawn pine door or the very popular Canadian classic pine barn door. Attractive, functional and reasonably priced you’ll find these doors become a conversation piece due to their unique construction and appearance. They add to the ambiance of your kitchen while being a practical solution for a pantry door. Perhaps you want something more formal or elegant to compliment the design you’ve chosen for your kitchen. Consider our stunning ancient oak sliding pantry door with a stainless steel hardware kit. This beauty will catch any guest’s eye because of its striking design and overall appearance. Another one of our popular more formal pantry barn doors comes in beautiful acacia wood, well known for its attractive grain and durability. Available in a classic Shaker style construction in wenge brown or textured grey you’ll find this door will add a whole new beautiful dimension to your kitchen and pantry area. Run this door on our reliable long lasting stainless steel or the stunning black steel sliding pantry door hardware kits and it will give you many years of fine service. Don’t forget, if you can’t find a pantry sliding barn door on our website that suits your style or the size requirements you need, you can always order a custom door. While our doors are readily available in common sizes we know that there is no one size fits all when it comes to home and kitchen designs. We can customize the type of wood, the style and size of the door and offer you a wide range of finishes that will match or enhance your present décor. Have a look at our website. Chances are you can find a door illustrated in a size, design and finish that that will meet your needs. Use our easy order process and you’re in business. You’ll be pleased with our quick turnaround time and speedy delivery. Take advantage of our free delivery in the GTA and low-cost delivery throughout cottage country. But if you have questions or encounter problems installing your new sliding pantry doors we’re available to help you out. Use our chat line and work with Dave our barn door tech support expert. He’ll be glad to sort out any issues that popup or order your custom door. You can also call us at 1.647.457.6011 or drop us a note at info@trendinghome.ca. Our team of experienced and friendly staff will assist you with any issue that arises. They’re there to help you make a beautiful design statement in your home.